I dedicated a corner of my veggie garden to growing rhubarb. It has a bitter taste when eaten raw, but when sweetened, this perennial vegetable is most popular in desserts. Having poisonous leaves, the stalk, which has a consistency like celery is the part that is used. To harvest rhubarb, you pull a few of the largest stalks from the base of the plant (pull them, do not cut them), then cut off the poisonous leaves. I wanted to use the rhubarb to make something other than the popular strawberry rhubarb pie. After being uninspired by a few popular recipe web sites, I had a lot of luck on a site called the Rhubarb Compendium. This web site is dedicated to compiling information about rhubarb- I guess there is a group out there for everything! The site has information on growing and using rhubarb, and even sells some pretty flashy "Got Rhubarb?" 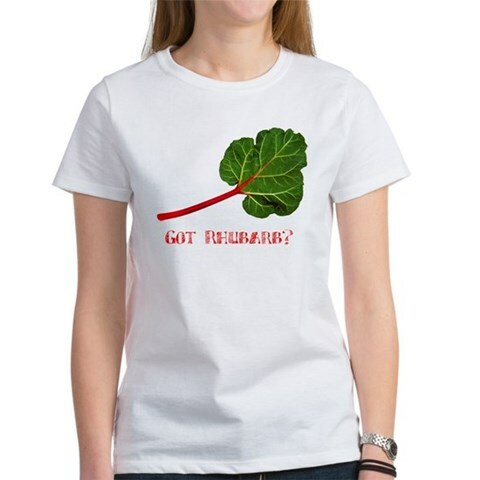 T-shirts, mugs, mouse pads, tote bags, aprons, ornaments, buttons, magnets, stickers, and many other fabulous things that you can buy to express your love of rhubarb! I decided to find a recipe for some type of rhubarb bar so I could share it at work and not have a whole pie sitting around my apartment for me to eat. Mix flour, oatmeal, brown sugar, and butter until crumbly. Press 1/2 into a greased 9"x9" pan. Add rhubarb. Combine sugar, cornstarch, water, and vanilla; cook until thick and clear. Pour sauce over rhubarb. Top with other half crumb mixture. Bake at 350 degrees F for 45 minutes. I was planning on a bar that you can pick up and eat with your fingers, but the bar didn't really hold together very well. However, the topping was crumbly and sweet and went well with the tangy rhubarb filling. It was so tasty that I don't mind eating it with a fork! And by the way- it is already half gone, so I'll have to wait for my next rhubarb harvest to share it with anyone at work... sorry!